Plimoth Plantation shares the iconic and well-known story of the famous Plymouth Colony. The site is the fulfillment of the boyhood dream of a young archaeologist by the name Henry Hornblower II. Henry founded the museum of Plimoth Plantation in 1947 with the support and help from business associates, family, and friends. The site started out as only a fort along the historic waterfront of Plymouth and two English cottages. Since its beginnings, Plimoth Plantation has now grown to also include the English Village, the Mayflower II, the Craft Center, the Wampanoag Homesite, the Plimoth Grist Mill, the Hornblower Visitor Center, and the Maxwell and Nye Barns. The Plimoth Plantation in Plymouth, Massachusetts provides visitors with personal and powerful experiences with the history of the Plymouth Colony. The site was built upon careful research about the English colony and the Wampanoag People in the 1600’s. Plimoth Plantation today offers an experiential and engaging indoor and outdoor environment for learning on its grounds, as well as at Plymouth’s historic waterfront at the State Pier and the Plimoth Grist Mill located on Town Brook. The many permanent exhibits share the interwoven and complex stories of the two distinct and different cultures of the area: Native and English. These exhibits are enhanced periodically with an array of programs for the public, workshops, and special events that provide a diverse and rich exploration of the seventeenth century. The Visitor Center at Plimoth Plantation welcomes visitors to the living history museum. At the center, guests can buy their tickets get an introduction to the site while viewing a short film. This film prepares visitors for the unique experience Plimoth Plantation offers through its living history outdoor sites that tell the story of the Wampanoag native people and the Pilgrims of the Plymouth Colony. The Visitor Center is home to the Museum Shops that provide a variety of products, such as handmade Native American jewelry and art, as well as products made in the New England region. During the winter season, outdoor exhibits at Plimoth Plantation are closed, however, the Visitor Center hosts several different programs and activities. The English Village at Plimoth Plantation is a re-creation of the seventeenth century small maritime and farming community of the Pilgrims at Plymouth. This village brings the history of the Plymouth Colony to life. 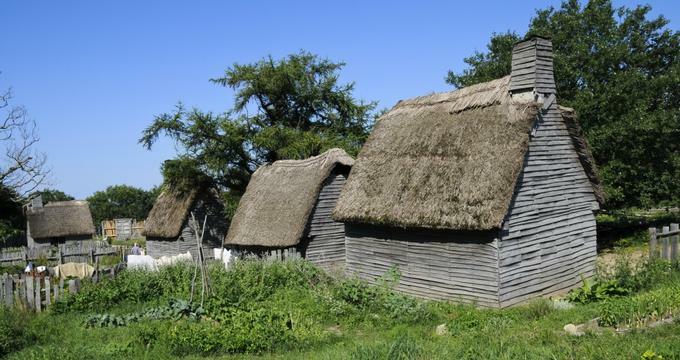 Within the English Village, visitors will see timber-framed houses similar to those built by the Pilgrims during the 1600’s, as well as items that they owned, heritage breeds of livestock, and kitchen gardens. Townspeople dressed in costumes portray the Pilgrim residents of the Plymouth Colony and share information about their lives with guests. Visitors will also have the chance to explore the Wampanoag Homesite at Plimoth Plantation. At the Homesite, guests will see how the Wampanoag people lived during the growing season along the coast. The people visitors will encounter at the Wampanoag Homesite are true Native Americans, not role-playing staff like in the English Village. These people share information about the culture and history of the Wampanoag People from a modern perspective.